The memory of war has many faces. Or perhaps it has only two? I have just returned from a journey to Belgium where the start of the Battle of Passchendaele, one hundred years ago, was being commemorated with much stately pomp. The long Battle of Passchendaele, which killed many hundreds of thousands of people, was part of the Great War. In Belgium, the words ‘Great War’ still apply to the First World War, as they do in the UK. Meanwhile, in many other western-European countries World War Two has taken its place as the most vividly remembered and eagerly memorialised war. It would be revealing to compile a longer list of fights, some probably much more recent, that figure as the war for different cultures across the world. For my own specialist area as an historian, the case is clear: for much of the nineteenth century, the ‘great war’ of Europe and of many colonised areas, too, was formed by the French and Napoleonic Wars which lasted from 1792 to 1815. The panorama near Waterloo (see below), by Louis Dumoulin. This duration alone makes clear that these wars shaped a generation or two in their thinking. Like with the First and Second World Wars, the human, material and economic devastation of these wars was enormous. And they were likewise turned to political profit by both winners and losers for ages to come. In sum, for nineteenth-century Europeans, the French and Napoleonic Wars were what shaped their consciousness of what war means, and why it should never happen again. 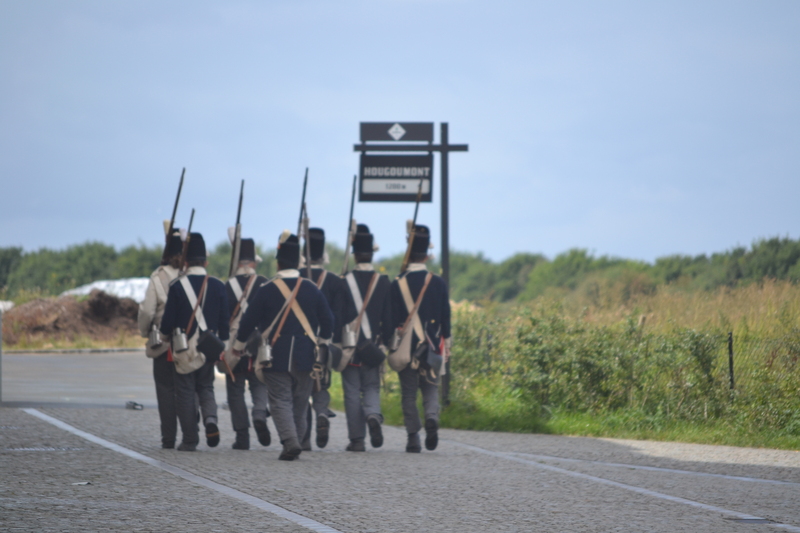 During my stay in Belgium I did not visit Passchendaele, but I did go to Waterloo, most famous of Napoleonic war locations. In and around the village of Waterloo a string of visitor attractions has been erected that can keep you busy for a long weekend, even if you are not the kind of person who engages in historical role playing or studying detailed maps of military campaigns – for both of which there is also plenty of opportunity around Waterloo. When I got out of our car I still half wondered whether Abba is partly responsible for current interest in Waterloo, but the tourism we encountered is clearly long-established and focused on different things. 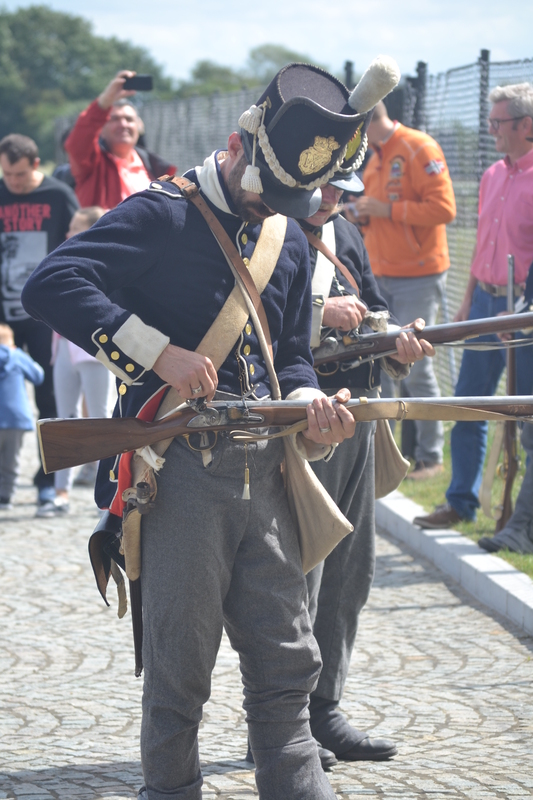 Tourism of what is now called the Battle of Waterloo started in 1815, right after the fighting. (I am writing a separate article about this, from which I might also publish extracts here.) An important impetus was given in the 1820s, when one of the victors who also happened to own the land commanded a monument on the site: an artificial hill mounted by a cast-iron lion. The commissioner: the king of the Netherlands. For him, the lion symbolised the Dutch monarchy, although it has historically also been associated with other aristocratic families and their territories, such as Flanders and England. At that time, Waterloo was still situated within the Kingdom of the Netherlands and the lion was positioned to face the old opponent, France. In 1830, however, Belgium began its fight for independence from the Netherlands, aided by France. As a display in the local museum tells us, the lion came under serious threat. Yet the battle field’s economic function as a tourist magnet saved the lion: armed locals successfully defended one of their main sources of income. Still, the lion had at that point changed from just being an anti-French symbol to also being a hated symbol of Dutchness. 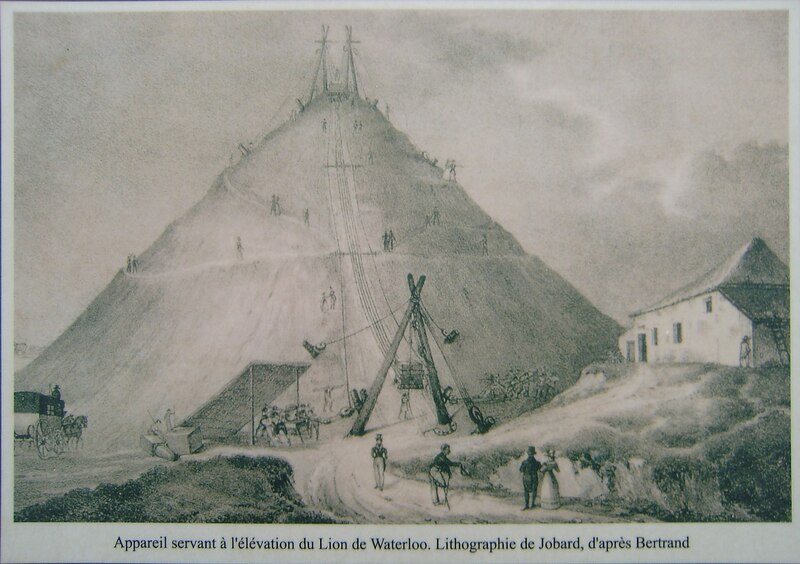 Marcellin Jobard, lithography (1825) of the Butte du lion under construction. Like in other panoramas, the scene partly consist of three-dimensional models and partly of an enormous circular painting. The painting, ironically, was done by Frenchmen. After all, the site now belonged to (French-speaking) Belgium. Evidently, Frenchness had lost its political sensitivity in this region, especially in these years leading up to the First World War, when tensions were building between Belgium/Wallonia and Germany rather than France. 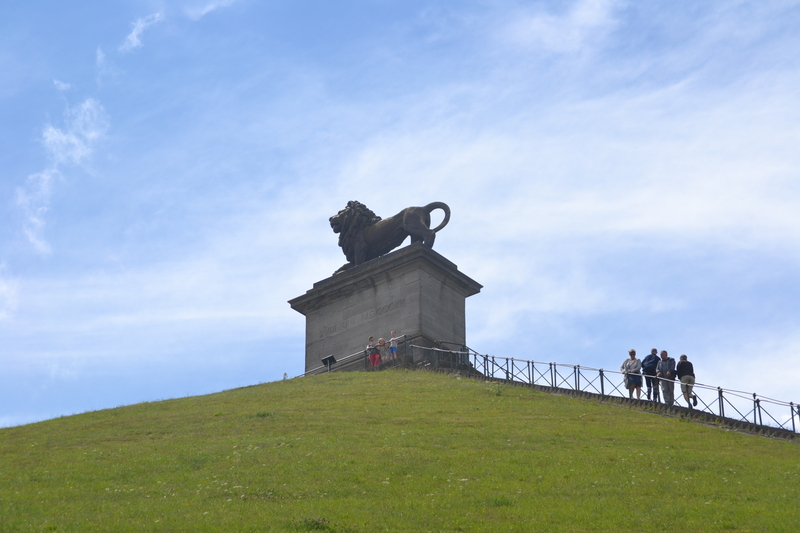 Present-day visitors, with the panorama’s spectacle of despair fresh on their retina, are then invited to climb the mound and imagine the historical war painting as an overlay of the peaceful fields surrounding the lion. The fields around the lion look peaceful now. In the distance: two more monuments. 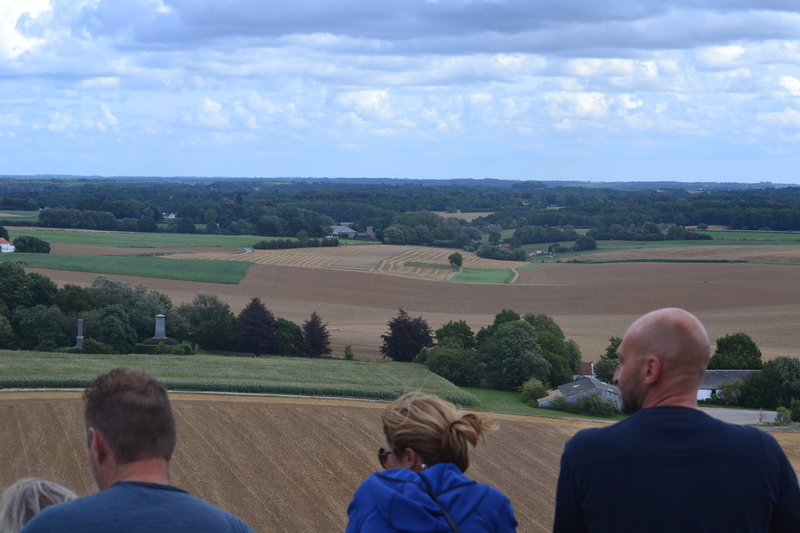 Next to these two sights (the lion’s mound and the panorama), visitors can wander around the site of the battle itself, including a brand-new museum and the ruins of the Hougoumont farm-fortress, one of the locations where the allied forces were beleaguered in 1815 and which again includes many visitor displays. In the village of Waterloo itself, moreover, is a Wellington museum, and nearby Napoleon’s headquarters can be seen. Near the mound tourists can rest in the ‘Bivouac de l’Empereur’: the name of the brasserie refers to Napoleon, its logo to the Dutch lion, and its menu and website to beef Wellington and English tea rooms. When we have our lunch, we are in fact a little uncertain as to whether we are sitting in ‘Napoleon’s bivouac’ or in ‘Wellington’s café’. Signage is ambiguous – and perhaps on purpose, for why not cast your net for customers wide? Such re-appropriation of history by authorities, visitors and shopkeepers alike, was and is visible throughout the site. A strange mixture of merry entertainment and ear-splitting education – for those who want to hear the message. The museum bookshop has sections in English, French, Dutch and German, with the English section focusing heavily on the worshipped Iron Duke (Wellington) and including such volumes as the ironically titled ‘How the French won Waterloo (or Think They Did)’. The museum itself, meanwhile, is more Napoleon-oriented, with displays on his social innovations and a wall-high portrait towering over all the other portraits in the room, which feature the diminutive heads of state that opposed him. Has the fact that the museum was created by the mostly French-speaking Walloon region, which contains some fiercely anti-Flemish figures, anything to do with this? Or perhaps Napoleon simply appeals to the international imagination a little more than does Wellington? The German historical forces receive less attention both in the museum and by German visitors themselves, judging for instance from the languages represented in the museum bookshop and restaurant menu. The Prussian, Hanoverian and other German contribution to the 1815 fighting was in fact enormous, but German military admiration has fallen rather out of fashion in the twentieth century, unlike e.g. the British, which may explain the modest German presence in Waterloo. 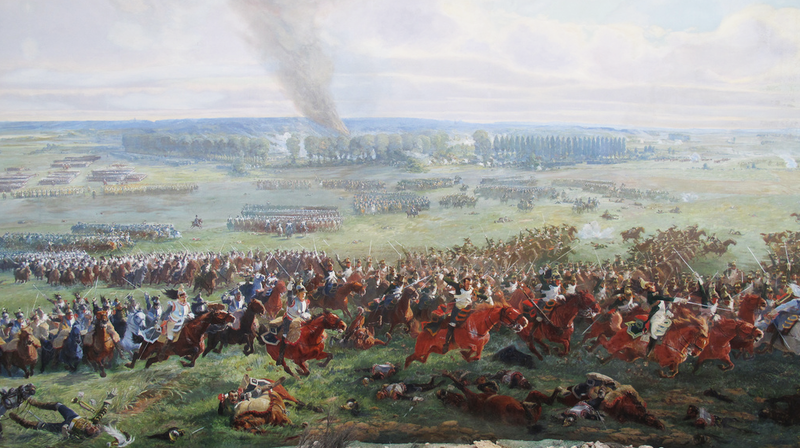 Another explanation is that the Battle of Leipzig (1813, Napoleon’s first defeat) perhaps takes a greater part in the German collective memory. The Scottish identity, on the other hand, is given a boost in Waterloo, with special Scottish days being organised and visitors walking around with the Scottish flag across on their bellies. The little chapel at Hougoumont is an equally many-faced space. Here, Catholic rather than nationalist pilgrims may find a scorched crucifix hanging over the door: the very crucifix which extinguished the fire at the farm in 1815. 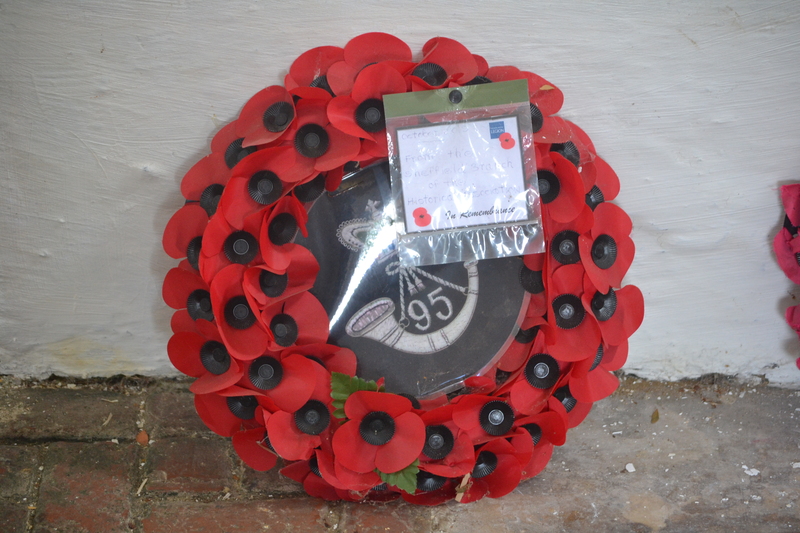 Yet in the same chapel, British regiments and other UK visitors lay wreaths of poppies, thus appropriating a symbol from their Great War for a much older war. They leave messages in the chapel’s visitor-book: ‘They fought for our freedom’. Freedom from whom, one wonders, and freedom to do what? So far, I have not come across the use of poppies in relation to the Norman invasion of the eleventh century; possibly because the English did not win that war. Such selective memory rings uncanny bells. I must immediately add that the visitor-book does contain a great diversity of opinions, with many tourists simply being deeply touched by the horrors on display. On behalf of commercial interests, as many as five flags are displayed from the buildings near the mound: the French flag, in a generous gesture to include the war’s losers (this would be harder to find in commemorations of more recent wars: where were the German representatives in Passchendaele? Time has healed some wounds here near Waterloo); the Dutch; the British; and the Belgian and the German, flags of two states that did not even exist when the battle took place, suggesting that modern nationalist feeling is more important here than commemorating the events of 1815. I am also pretty sure I have seen the flag of the EU somewhere, symbol of a short-lived phase of cooperativeness between Britain, France and Germany. In short, there is a little something for everyone here, nationalists and cosmopolitans, pacifists and militants. One striking point though: in a somewhat insincere attempt at reconciling all the different viewpoints of past and present visitors, the concluding display in the museum tells us that although many nations have warred over Waterloo and tried to make it their own, in the end it really only belongs to one place: Wallonia. How about this for a pacifying conclusion to an exhibition about war, in a country torn apart by Flemish and Walloon nationalists? So do these commemorations have many faces? Or just two faces? Janus is the two-faced god, the god of beginnings and endings; but also, appropriately, the god of war and peace, and the god of journeys. Perhaps he is also the god of people who travel to places of war. A Belgian friend commented on the commemorations at Passchendaele: ‘All these people, these politicians go to Passchendaele to say “never again”. But they don’t mean it’. A Janus-head has two faces, but also two mouths. One is used at commemorations. It shouts ‘never again’. Meanwhile, the other mouth whispers new commands. Photos by HG and AG, 30 July 2017.